Find the best deals on excellent Lindauer wines. Compare the latest prices from major UK sellers and redeem our vouchers if available. Find the best wines using various search filters, read reviews and Price History. Sign up to Price Alerts so we can email you about the latest discounts on your chosen bottle. Lindauer is one of the top 20 sparkling wines in the UK. A high quality Sparkling wine from New Zealand, it’s that country’s top selling and most exported fizz, and is owned by one of New Zealand’s leading and largest wine company Brancott Estate. Sparkling wine is currently one of the most buoyant categories in a difficult wine market at present, and is actually benefitting from the focus on value for money, during tough economic times. At a time, when the wine market is largely static, and the Champagne category is showing signs of decline, sales of non-champagne sparkling wine are growing at almost 9%, bucking the overall trend. This is largely due to the great value that these wines represent, compared to Champagne, but also because wine drinkers are now trusting these wines far more, as the quality and reliability of sparkling wines from regions other than Champagne, has soared. There is trust in these products now, and consumption has increased, as sparkling wine has become an everyday treat, rather than just a wine for special occasions. The growth has been driven by Cava, through the last decade, and for the last 5 years, by Prosecco, the current darling of the sparkling wine market. However, behind these, New World sparkling wines have been quietly developing their presence, and are now frequently, the first choice alternative to Champagne. What's The Background To Lindauer? Given that the first New Zealand Sauvignons were only made in the 1970s, and the first wines exported in the 80s, it is hardly surprising that no sparkling wine had been made in New Zealand until 1980. Montana, with their broad range of vineyard holdings, and experimental nature, were the first company to produce sparkling wine, making 20,000cs from Chardonnay and Pinot Noir fruit, grown in the Hawkes Bay and Gisborne area, and produced in the traditional Champagne method. The wine was named Lindauer, after the European painter, who was best known for his portraits of Maoris. With a total focus on craftsmanship and quality, the Lindauer brand evolved, and was swiftly marketed successfully not just in New Zealand, but internationally. It is now the biggest selling New Zealand sparkling wine, outsells all but a few Australian sparkling wines, and is exported to 14 countries. What Styles Of Wine Does Lindauer Make? There are two tiers of sparkling wines, within the Lindauer portfolio, the classic range and the special Reserve selection. Brancott Estate Sparkling Sauvignon Blanc – it was only a matter of time before a sparkling version of Sauvignon Blanc was launched, and it was Brancott who did it first, with a lively, fresh, zesty sparkling wine, very different to the traditional sparkling cuvees (but made in the same traditional method), with its tropical tang and refreshing citrus edge, made entirely with Sauvignon Blanc grapes from Marlborough. 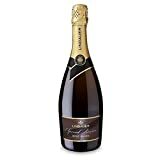 Lindauer Chardonnay/Pinot Noir Brut – a traditional sparkling blend, following the classic Champagne blend, using grapes from Hawkes Bay and Gisborne to create a full bodied, yet elegant, creamy, almost nutty and toasty fizz, with a fine mousse. Lindauer Rose Brut – a vibrant, full flavoured Rose, with more depth of colour and flavour than many New Zealand Rose; this is because of a proportion of dark-skinned Pinotage in the blend, to add to the structure and colour. It’s bold, ripe, and full of character, with masses of exuberant red berry flavours, and an intense, stylish finish. The classic range also includes an off dry Rose, called ‘Fraise’, a sweeter style, demi sec, and 2 varietals, a Pinot Gris and a Sauvignon Blanc, although these have not been spotted yet in the UK market. The Special Reserve range includes a very stylish, creamy Blanc de Blancs, made entirely from the Chardonnay grape, with an elegant, citrussy delicacy. There is also a Special Reserve Brut and a sweeter Cuvee Riche in the range. Many people think sparkling wines are only suitable as an aperitif, but increasingly, are discovering that many of them work well with food also. The lighter styles are great with canapés, smoked starters and nibbles, but the richer styles work well with salmon steaks, and even some chicken dishes. Of course, one of the best accompaniments for sparkling wines, brut or Rose is a simple bowl of strawberries.